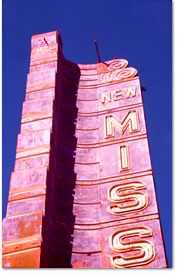 The New Mission Theater, once the grande dame of Mission Street's theater row, closes for business in 1993. A retail furniture establishment subsequently moves into the former lobby. City College of San Francisco buys the property, and the adjacent retail store, to develop as a new campus, in 1998. Community activists, alerted to continuing plans to build a campus on the site without the inclusion of more than token remains of the theater, attend a planning meeting at the current Mission campus, September 2000. When they attend a second meeting in October, they are asked to leave. In November, the group holds a meeting with college officials and architects Kendall Young/Cervantes in which they review preliminary plans for the site, featuring only the blade sign of the historic building. No other nod to preservation is included. A public meeting is held at Horace Mann School to discuss the issues on January 10, 2001. The meeting became an attack on those who wanted to save the theater as anti-education racists. Ken Garcia of the San Francisco Chronicle writes an article on January 13, 2001, "Compromise Called for on Movie House: College Could Easily Keep Part of Old New Mission." The same month, San Francisco Architectural Heritage nominates the New Mission Theater for inclusion on the National Register of Historic Places. Throughout 2000 and 2001, the City College administration continues to foster the either/or myth of education or preservation, while neighborhood activists work to formulate solutions to the conflict. In February 2001, the Save-New-Mission group is awarded a grant from the National Trust for Historic Preservation in order to work with a preservation architect to study the space for adaptive reuse. A fund-raiser to match the grant with private contributions is held the same month. Architect Alice Carey of Carey and Company agrees to formulate a plan for adaptive reuse for the theater. Also in February, the theater is nominated for inclusion in the list of the National Trust's Eleven Most Endangered Sites. City College also addresses preservation plans, with the aid of another San Francisco architect who specializes in preservation. The study results in three different plans, two of which still demolish most of the theater. The Rules Committee of the Board of Supervisors hears the matter at City Hall on April 12, 2001. Supervisor Matt Gonzalez encourages City College to work toward a solution that will respect all points of view. The Chancellor goes on record to say that the college will work with the preservation group. He also states that preservation efforts have not and will not cause delays in the planning and building of the Mission campus. In June, the National Trust for Historic Preservation declares single-screen theaters nationwide as a building type to be included in their list of Eleven Most Endangered Historic Places. There is special mention of the historic theaters of San Francisco. The San Francisco Landmarks Advisory Board votes to find the nomination submitted by San Francisco Architectural Heritage worthy for submission to the State Office of Historic Preservation, July 18, 2001, but a quorum is subsequently deemed to have been lacking. City College and its supporters vocally oppose the nomination, and object to the July Landmarks Board procedure. When the San Francisco Landmarks Advisory Board reconvenes with a larger attendance, it votes to have no opinion on the matter, August 2001. The California Office of Historic Preservation recommends unanimously that the theater be placed on the National Register of Historic Places, August 3, 2001. The college administration and board are presented preservation alternatives, such as the cost-effective alternative proposed by the activists and Carey and Company, with the support of the National Trust. This plan includes virtually all of the theater in an adaptive reuse, while meeting the programmatic needs of the campus. City College dismisses the alternative plans as too expensive, and instead choses to relocate the planned campus and to sell the New Mission Theater and its adjacent property. At a December 3, 2003 hearing. CCSF Board rejects the offers of both Cullinane & Long and the Pacific Institute, in favor of Gus Murad & Associates. On February 4, 2004, the Landmarks Board votes to support a landmark resolution adding a recommendation that final action on the landmarking of the New Mission Theater be postponed while questions of ownership and plans for the building are resolved. On March 3, 2004, the Landmarks Board re-hears the landmark resolution and votes unanimously in support. The following day, the Planning Commission echoes this decision with a unanimous vote for landmarking. On May 18, 2004, the San Francisco Board of Supervisors voted unanimously in favor of an ordinance designating 2550 Mission Street, the New Mission Theater as Landmark No. 245. The Landmarks Board meet on October 11, 2006 to view owner Gus Murad's proposal to rennovate and restore the New Mission Theater, making it into a theater-nightclub-restaurant venue, with the adjacent Giant Value property being converted to commercial space on the street level and residential above. At a special meeting of the Landmarks Board at the New Mission Theater on October 11, 2006, owner Gus Murad's architects, Kerman/Morris Architects, unveiled impressive plans to restore and rennovate the theater. The plan is to use the space as a nightclub/restaurant venue using the stage for concerts and DVD projection. The adjacent Giant Value property, included in the theater's purchase from City College in 2003, is to play a contingent role in funding the New Mission's work. Pending approval from the Planning Commission, the Giant Value space will have commercial space at the street level and residential condos above. Murad intends to fast-track the restoration of the theater once the plans are approved. The architect reported that while the auditorium area was in surprisingly good condition, the ceiling over the entry way and the unstable walls of the outer lobby area require considerable work. Interest was voiced at the meeting that the New Mission's continued capability to project 35mm film should be an important consideration. The pictures below show the building as it appeared on the day of the Landmarks Board hearing. The graffiti much on display was the result of a rave event held in April 2006. SF Gate reports Jan. 27: "[New Mission Theater owner, Gus Murad] originally intended to build a market-rate condo project on the Value Giant site and use the profits to restore and develop the New Mission Theater. But complaints that Murad was using his political ties to former Mayor Gavin Newsom to push the project, combined with concerns about putting high-priced condos on Mission Street, stalled the project." Per Murad's spokesman, P.J. Johnson: "The sale (of the Value Giant and New Mission Theater sites) is more a negotiation to bring in new investors to jump-start the stalled development." Heather Smith of Mission Local reports Jan. 26 the New Mission Theater is once again up for sale, this time separately from the adjacent Giant Value property. Reportedly under negotiation is its purchase by a New York company planning an ambitious nightclub venue. The realtor cites historical considerations, "Because it’s historic, you have to keep everything original. From the balcony to the urinals." Texas-based Alamo Drafthouse met with San Francisco's Architectural Planning Committee to present their proposal to convert the New Mission theater into a 5-screen multiplex entertainment complex including a bar replacing the first floor's projection booth. Alamo Drafthouse is in contract with Gus Murad and Associates to purchase the historic New Mission Theater at 2550 Mission. Both the New Mission and the adjacent Giant Value store went up for sale in 2011. The San Francisco Planning Commission approved a $10 million renovation of the New Mission Theater, as well plans for construction of a 114-unit condominium development in the adjacent former Giant Value space. Theater plans include a 348-seat theater and four smaller screening rooms, as well as a full restaurant and bar. Work is projected to start as early as Summer of 2013. In his July 3 press release CEO/Founder Tim League reports final building permits have been approved, and theater renovation is about to begin. Though a firm date has not been set at this point, the theater is slated to open in 2015. Also announced are plans to include capability for Sony 4k Digital, RealD 3D and changeover 35mm projection. Renovation is well underway with photo coverage of the transformation in progress. View Alamo Drafthouse Cinema's Flickr photostream. The Alamo Drafthouse Cinema New Mission is to open on December 15.